Feel the need for speed? Then put on the Top Gun Adult Bomber Jacket and ride into the danger zone. 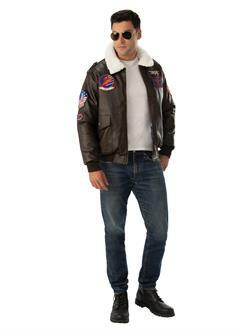 The brown jacket features a white plush collar and is inspired by the jacket worn by Tom Cruise as Lt. Pete “Maverick” Mitchell. The jacket features a front zipper, shoulder straps and Top Gun insignia on the arms and chest.